Let your Grandpa know how truly special he is with his very own Personalized Sweatshirts from his most precious grandchildren. He will beam with great pride every time he wears his unique Grandpa Shirt. 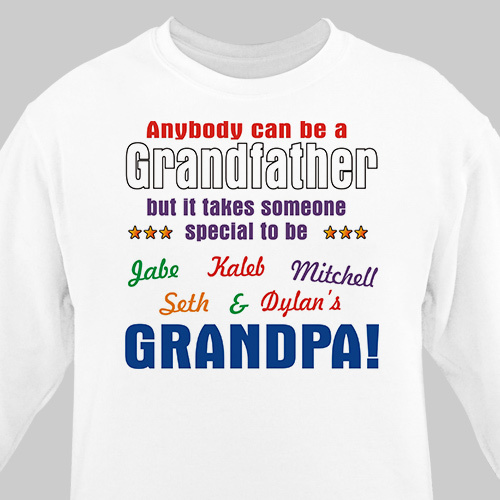 Your Grandfather Customizable Sweatshirts are available on our premium white cotton/poly blend Personalized Sweatshirt, machine washable in adult sizes S-3XL. Also available in Ash Gray. Includes FREE Personalization! Personalize your Grandpa Sweatshirt with up to 30 names. It was exactly what I expected. I love it. Only a little unsure of size, it ended up a little big. But besides that it was perfect. Great gift. . The thickness of sweatshirt is not very good but again the price reflects this so it is good.